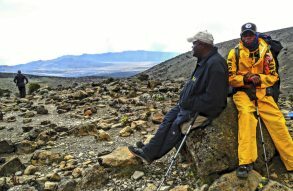 Guest post from Frances Stewart who climbed Kilimanjaro with her family in May 2013. Tusker Trail gets an A+++ in our book. On May 29, 2013 my son, husband and myself reached the summit of Mt. Kilimanjaro because we traveled with Tusker Trail. We could relax and enjoy the journey because we always knew we were in the best of hands with the Tusker team. They would steer us to safety and success. It was so refreshing to witness the respect Tusker guides have for the safety, welfare and happiness of all members of their team, not just their clients. 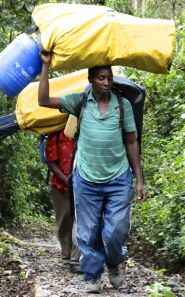 This is because the guides have been porters themselves and know the rigor of this job. Such support for each other resulted in an unmatched team spirit. We felt cheered on daily by 23 supportive porters, camp coordinators, kitchen staff, and guides. The caring is genuine. There is always a belief and goal that you will make it to the summit, even if you lack the total belief in yourself. You are encouraged to accomplish more then you thought you could ever do, yet always under the safe watch of experienced guides. The guides have extensive knowledge and training about the mountain, health issues, problem solving, and know how to use the safety equipment they carry. No one badgers you about money or tips. Instead the staff stress how proud they are to be part of such a top company. They are all invested in being the best they can be. The USA staff also are very professional, never pushy, always enthusiastic and encouraging. The Tusker Team is fun to be with, all of them. They smile and greet you at every chance. No request is too large. They are eager to please. Many people in the team look for ways to make your trip easier and more enjoyable like cleaning the toilet several times a day, meeting any kind of food request and ALWAYS cooking superb and nutritious meals, setting up perfect camp sites, filling your bottle with hot water for heat at night, packing your sleeping bag, (which is hard to stuff in the cold), helping to carry your pack, or just hanging around with a smile. These men are courageous and kind. They will treat you like family, even better. If I were asked how do you recommend climbing Mt. 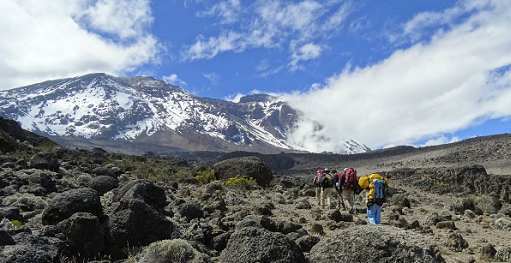 Kilimanjaro, I would say look no further, only climb with Tusker Trail. And go for 9 days. Every day you spend on that mountain is worth it to prepare your body and mind; you can resume the rest of your life later.